The soft, contoured satin cover is designed to reduce wrinkles on the face while sleeping helping with complexion. It also helps to keep hair-styles in place. 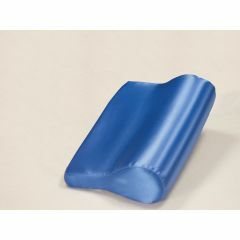 This contoured pillow is constructed with high-quality, precision-cut foam to ensure years of comfort and use. It is covered with a luxurious satin cover that is gentle on your face and hair. The compact size of the AB Contour Pillow makes it a convenient traveling companion. smaller than original one. not as sturdy as original. would like extra covers. Is this pillow returnable if not satisfied?